The ancient 300 year history of the claddagh ring makes it one of the most meaningful jewels in history. 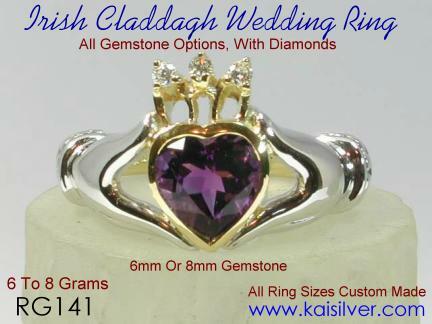 Kaisilver creates the best rendition of the Irish claddagh ring in gold or sterling silver with gemstones of your choice. Every ring is created by some of the world's finest craftsmen and hand finished to perfection. The history of the claddagh ring takes us back in time to around 300 years. The most popular Irish folklore claims that the first Claddagh ring was made by an Irish fisherman (turned slave) named Robert Joyce. Around 300 years ago there lived a fisherman in a small fishing village in Ireland. The fisherman was Robert Joyce and the village was called the Claddagh. The boat in which Robert was travelling was raided by pirates and he was sold as a slave to a rich goldsmith by his captors. Robert Joyce worked for his master and learnt the trade during his tenure as a slave. Despite the hardships and a tough life he never forgot his beloved who lived far away in the Claddagh village. He spent the little spare time that he had in creating a ring for his beloved, this ring was soon to become the now world famous Claddagh ring. As we trace the history of the Claddagh ring, it would be obvious that we need to understand the significance and meaning of the Irish claddagh ring as well. Robert Joyce was released from slavery a few years later and returned to the Claddagh village. He presented the ring that he had made during his tenure as a slave, to his beloved. This ring came to be known as, the now legendary Irish Claddagh ring. The history of the claddagh and the very hard circumstances under which the first claddagh ring was made by Robert Joyce, have added special meaning and significance to the Irish claddagh ring. The ring depicts a heart held by two hands and also has a crown on the heart. These features of the ring have given the ring a few other names like the 'clasped hands ring', the 'heart and hands ring', 'hands holding a heart ring' etc. The Claddagh ring belongs to a group of rings referred to as the 'faith rings'. Each of the above mentioned features of the Irish claddagh ring has a deeper meaning with, the heart showing love, the clasped hands are held out in friendship and the crown on the heart signifies loyalty. Rarely in history has a jewel with such siginificance been made. In today's materialistic world love, friendship and loyalty seem to be diminishing by the day and this is perhaps the reason why the Claddagh ring has become popular in countries far away from Ireland as well. 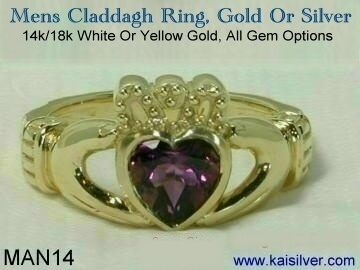 Kaisilver creates the best rendition of the Irish Claddagh ring in silver or gold. The tradition and history of the claddagh were thoroughly studied by our team of designers and craftsmen. This is the reason why our Claddagh rings retain all the features of the original claddagh ring that was made around 300 years ago. Each ring is made individually and worked on by highly skilled craftsmen and high end craftsmanship with flawless handfinishing is provided. You will notice the details on the hands and band of our claddagh rings. You can order your Kaisilver claddagh ring in 18k white or yellow gold or sterling silver, the same high end craftsmanship is provided for both silver and gold claddagh rings. Every gemstone is handpicked and custom cut by experts and you have all gemstone options. Our rings have good gold or silver weight and the design borders the entire gemstone with gold, thus adding to the long term durability of your Claddagh ring. Click Here for a complete selection of our claddagh rings. 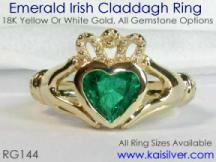 and you will see why hundreds of buyers in more than 7 nations get their Irish claddagh rings from Kaisilver. The claddagh ring will go down in history as one of the most meaningful jewels of all times. If you trace the history of the Claddagh and discover the harsh conditions in which the first claddagh ring was made, you will immediately be struck by the significance of this Irish ring. The ring is ideal as a birth stone ring and with the unlimited choice of gemstones that Kaisilver provides, you can order this ring as a very special birtstone ring. We have provided a comprehensive list of birthstones for you to check which gemstone represents your zodiac sign and month of birth Click Here For Birthstone Information And Charts. The history of the Claddagh ring says that the first Claddagh ring was presented by Robert Joyce to his beloved. Robert had never forgotten his beloved during his tenure as a slave. The couple soon got married and lived happily ever after. The claddagh ring is also the most prominent Irish wedding rings and traditionally, the mother passes her claddagh ring to her daughter on the daughter's wedding day. Love, loyalty and friendship is what marriage is all about and it is obvious that the claddagh ring would make an impressive wedding or engagement ring for just about anyone. You do not have to be Irish to wear or know the significance of this ring. 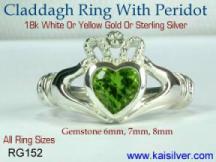 Kaisilver has created a premium version of the Irish Claddagh ring that is suitable as a Claddagh engagement ring or a Claddagh wedding ring. The design is shown in RG141 above and can be ordered with the gemstone of your choice. This version has genuine diamonds in the crown and is available in 18k white or yellow gold. You can also choose the two tone gold option as shown in the image. If we trace the history of the Claddagh ring back to it's origins, we know that the first claddagh ring was gifted by a male (Robert Joyce) to his beloved. However, as the Claddagh tradition carried on, men started to wear them too. 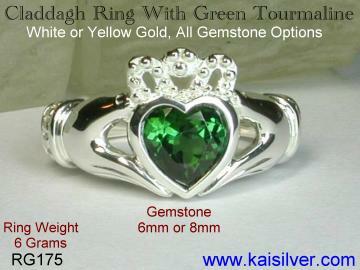 Considering the active lifestyles and habits of modern men, Kaisilver has designed a claddagh ring specially for males. You can see an example design MAN14 on this page. These men's claddagh rings are strong and sturdy and weigh a minimum of 12 grams. The weight can move up to 25 grams or more, depending on the specific ring size required. We have not compromised on quality and apply the same high end craftsmanship for claddagh rings for men. The gemstone can be size 8mm, 9mm, 10mm or larger. Each ring will be individually created as per your requirements and ring size required. You have a choice of all gemstones and two tone gold is also available as an option for men claddagh rings. Kaisilver created the world's first high end men's ring with good weight, good craftsmanship and handpicked gemstones. Our designers and craftsmen have studied the lifestyle and habits of today's men and input their findings, into ever men's ring that we make. Kaisilver men's rings lay emphasis on long term durability without compromising on craftsmanship and style. 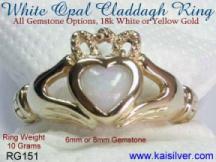 Your Claddagh ring can be ordered in 18k yellow or white gold or sterling silver. The same high end craftsmanship is provided for both silver and gold version. We also provide a two tone gold option where a combination of 18k yellow and white gold is used in the same Claddagh gemstone ring. You could for example, have the entire ring made in white gold and use yellow gold only for the portion around the gemstone. The gemstone size ranges from 6mm to 8mm and you can see the details in the table below. The prices mentioned do not include diamonds in the crown. If you need diamonds, please add another 100 U.S$ to the price. The diamonds are genuine round diamonds of size 2.5mm (1 piece) and size 1.5mm (2 pieces) and are set in the crown. The same price is charged for the two tone gold option where white and yellow gold are combined in a single ring. White gold and yellow gold is priced the same. In the case of sterling silver jewelry, no rhodium or other plating is done. While gold or rhodium plating can be provided for silver jewelry at no additional charge, please remember that all plating will wear off with time. Both silver and gold jewelry has the same high end craftsmanship. Our team of experts will let you know if your ring size requires a weight that is more than mentioned. For an additional 100 U.S$, you can add a few genuine diamonds in the crown of your Calladagh ring. The diamonds are round 2.5mm (1 piece) and 1.5mm (2 pieces). The shipping charge is 25 U.S$ worldwide and we can ship through FEDEX or EMS with web tracking. Shipping is done within 4 to 5 weeks of order confirmation and receipt of payment. We need this time due to the individual attention provided for every single jewel. We do not indulge in mass production and always provide the finest craftsmanship that you can find in custom jewelry. All gemstones are hand picked and custom cut, no close out and reject quality gimmicks are played at Kaisilver. We will not compromise on quality and rush the production process inorder to get your order. The best way to get your Kaisilver custom jewelry on time is to order it well in advance.